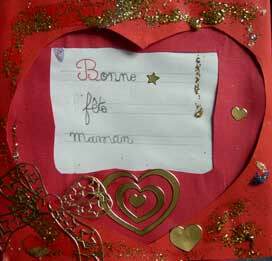 How to make this card, created by Evelyne Jeu , Kindergarten Boissière ? You need: red cardboard, spangles and colored stickers, glue, a heart-shaped stencil. Cut out of the red cardboard a rectangle twice as long as it is wide ; fold it into 2 .Using the stencil,draw and cut out a heart in one half of the rectangle which will constitute the front page of the card. To make the inside of the card, cut out a second rectangle of the same size (you can use a sheet of a different color to make a contrast, which has not been done for the shown card). Cut out a rectangel in the first page of the second sheet. 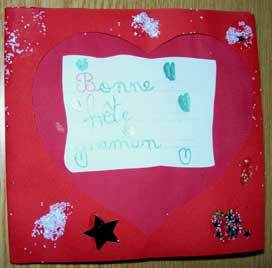 Glue or slip between the two sheets the paper where each Child has written “Happy Mother's Day Mom”. Decorate according to your taste the interior of the card.